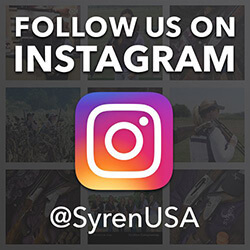 This is a custom designed Syren branded case from the Americase Premium Series designed for your Syren over/under shotgun. The sturdy, anodized aluminum frame and extremely strong side panels yeild a case that resists warping and dents. This case is designed with compartments for the stock, barrel with fore-end on and one storage area. The interior is covered in a beautiful jet black velvet which is not just for looks, but also for protection. Syren logo is embroidered into the lining of the case lid. Your gun stock is secured with a grip strap. This case comes with two high quality key-lockable latches and a combination lock and meets airport security guidelines. Both sides of the outer case feature a vinyl Syren logo. *Cases for single barrel Field & Sporting guns up to 30″ are available now. Cases for two barrel Field, Sporting and Trap guns up to 34″ will be available shortly!